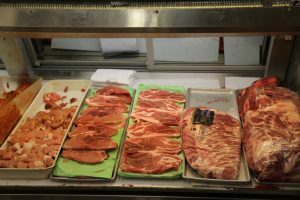 OUR MEAT MARKET DEPARTMENT is what made us famous all these years! We offer the best and freshest choice of meat. Presently we have three meat cutters working at Barron’s with 85 years of experience between them. When you visit our meat market you will feel the pride, dedication, and experience in their field. This dedication is reflected in their work and customer base. How many places can you go to where they know your name or how you like your meat cuts? Not many! Next time you need steaks prepared and marinated, call us! Frank, Robert, & Alfredo will take your order and prepare it as if it was for their own family!